One night about 4 or 5 years ago, my friend Matt and I went to see a movie at the wonderful little independent movie theater in Dupont Circle just a few blocks from my then-apartment. I think the movie was Capote. After the movie, we wandered out onto the sidewalk and spent a few minutes trying to figure out where to go to dinner, when, just over Matthew's shoulder, I spotted one of my journalism professors, a cranky veteran reporter with a slightly jaundiced pallor, standing intimately close to a much younger girl with long thick hair and Asian features. The dinner was good; I ordered costolleta alla milanese, which was the most expensive entree on the menu, and Matt some kind of pasta, which I recall him describing in a very Matt-like way as being "great but not memorable." But really, it was the dessert that somehow buried itself into my brain as one of the most perfect things I've ever tasted: a white wine poached pear served with vanilla ice cream and an ethereal coat of caramel sugar. I spent the next 15 or so minutes in absolute rapture as I ate and exclaimed and forced spoonfuls of my dessert at Matt who was (I'm absolutely sure) nursing some kind of coffee beverage. The funny thing that I'm realizing as I write this, is the way that magnificent pear seems to have frozen all the details of that night in my brain. It was the first poached pear I'd ever eaten, which I suppose explains some of the fascination, but to be honest there was something magical in the blend of flavors that really captured my imagination, and which (I suspect) I've been trying to recreate with every single vanilla bean I've split and scraped ever since. 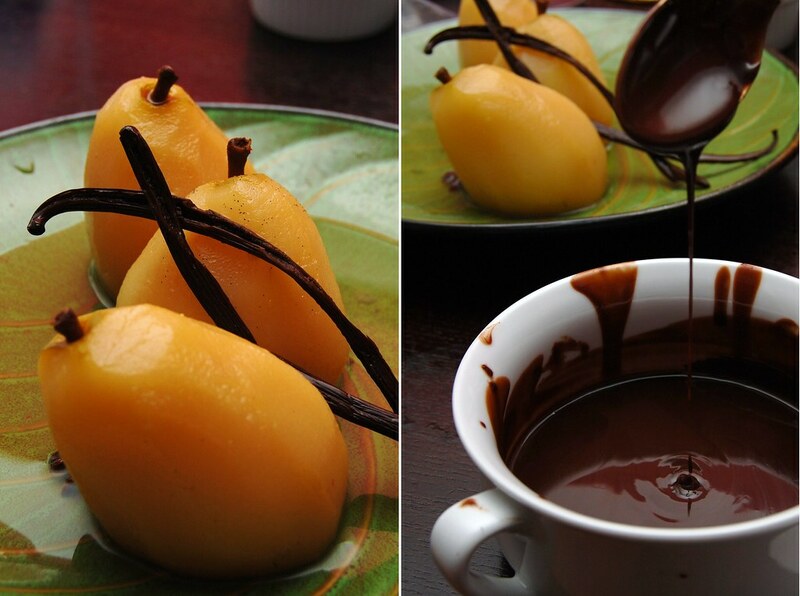 These pears...the ones I'm offering you today, I'm sorry to say, are not as perfect as the one I had that night. But they are wonderful and taste the way I suppose the word "gold" would taste if you were to lick it one quiet afternoon. 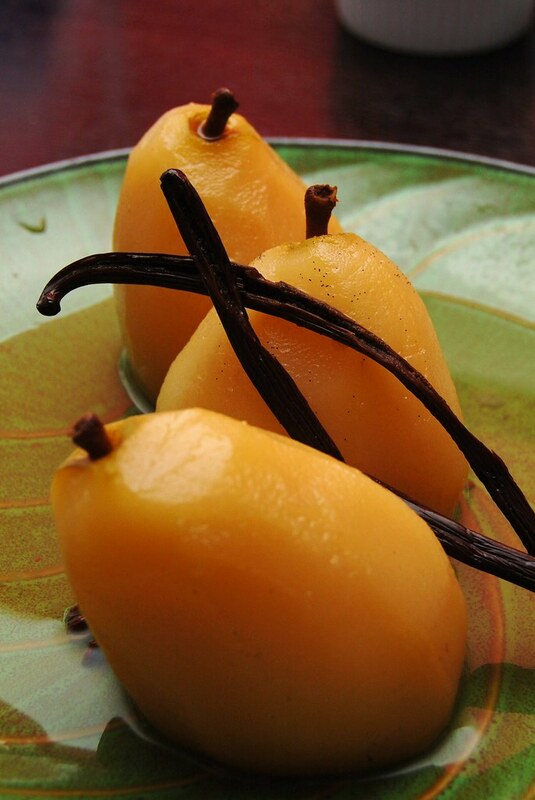 It's the anise and the vanilla, which infuse the syrup, and (of course) the fat little pears which sit solidly on the plate, swollen and brimming with vanilla speckled nectar. And because when things are good I just like to keep on pushing, I served these with warm chocolate ganache and a spoon for drizzling. Serve these on Thanksgiving as your dessert, along with kiwi sorbet and some kind of boozy cake. They're actually perfect for a crowd since they can be made ahead and can be served cold or at room temperature or even hot, if you prefer. And the leftovers can be sliced and heaped over a pile of pancakes or baked into a clafouti then served to the family member who still happen to be hanging around the morning after. New to Always Order Dessert? Consider subscribing to my RSS feed, follow me on Twitter, or sign up to receive my once-a-week e-mail updates by filling in your address in the box on the right. And if you ever need any entertaining or cooking advice, please don't hesitate to e-mail me. 1. Peel the pears, leaving the stems in place. Core from the bottom. Use a paring knife to slice off a tiny bit of the bottom in order to create a flat base. 2. 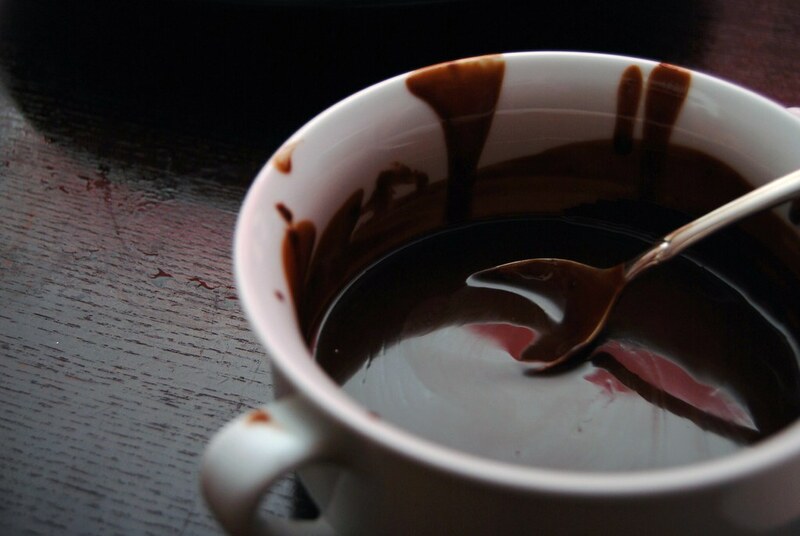 In a 4 or 5 quart saucepan or dutch oven, combine the wine, water, sugar, honey, vanilla, anise, and cloves. Set over medium-high heat and bring to a boil, stirring occasionally to make sure all the sugar and honey is dissolved. 3. Lower the heat to a gentle simmer, and place the pears in the liquid. If the liquid doesn't rise high enough to cover them while upright, place on their sides, but rotate every 10 minutes so that they are poached evenly on all sides. 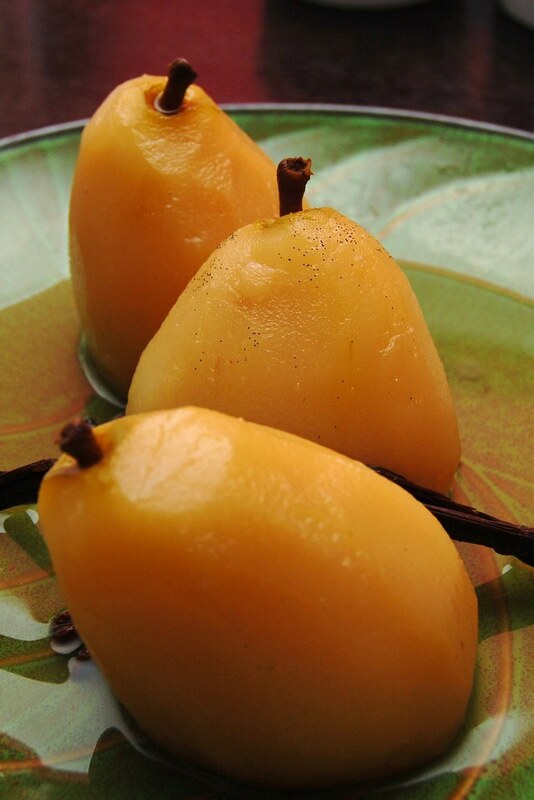 Continue to cook for 25-30 minutes until the pears are tender but not mushy (use a thin knife gently inserted in the side of the smallest pear to test). 4. Remove the pairs to a large air-tight container and cover with the liquid. Let cool to room temperature, then cover and place in the refrigerator to chill (up to 24 hours). 5. The day you are ready to serve, remove the pears to a serving dish and pour the liquid back in a saucepan. Reduce the syrup over medium-high heat for 15-20 minutes until slightly thick. Let cool to room temperature before pouring over the pears. Serve alone, with whipped cream, or with a drizzle of chocolate ganache. these look so beautiful, almost like they are glowing! I am poaching pears for the first time today to serve in a pear tart- I hope mine hold up like yours did! I'm really worried that they will just turn into mush! You've given me considerable hope that this will not be the case. Thanks for the recipe and as always a lovely story too! Hi Alejandra! This is such a gorgeous dessert, thank you for sharing it. I hope you have a wonderful Thanksgiving. 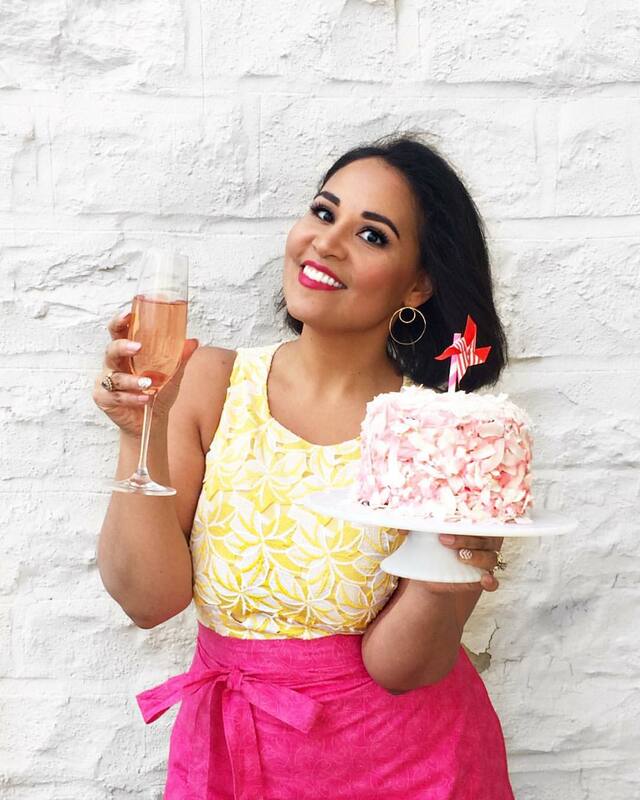 I can't wait to stop by throughout the holidays and check out what delicious desserts you make then! Cute story :) Your pears look amazing! wow wow wow! that's all I can say. I would love to be able to try this one day.